Top your baked potato with Greek yogurt. Potatoes are full of fiber, folate, potassium and vitamin C, making them a healthy addition to any meal. 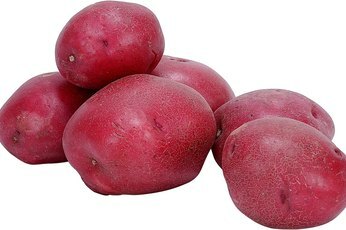 Opt for something different and select colored potatoes, rather than traditional russet or red bliss varieties. Potatoes come in purple, orange and red hues, which are loaded with extra antioxidants to protect cells and keep your body healthy. 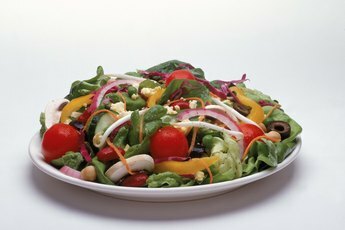 Dry cooking methods, such as baking, heat food without adding fat or calories. Baking potatoes takes a while, so toss them in the oven while you prepare the rest of your meal -- and make extra potatoes for tomorrow night, too. Preheat the oven while you prep the potatoes. Remove sprouts and thoroughly wash the potatoes. Rubbing the skin dry helps eliminate any remaining dirt. Wrap potatoes individually in foil and bake at 350 to 400 degrees for about an hour, until tender and soft to the touch. As an alternative, place foil-wrapped potatoes on the top shelf of your outdoor grill. They'll get a rich, smoky flavor and continue to cook while you take time grilling steak or chicken. Boiling cooks potatoes fairly quickly and makes them soft for mashing. Leaving the skin on increases your fiber intake. Small children or elderly adults may not be able to chew the skin, requiring you to peel potatoes before cooking. After cleaning, cut the potatoes into halves or quarters. 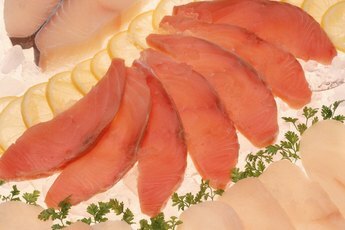 Gently place the pieces in boiling water and cook for several minutes, until the skin starts to break away when they are tender. Depending on the piece sizes, this may take 20 minutes or more. Drain the potatoes in a colander, then mash them with your favorite toppings until they are smooth. If you're in a hurry, microwaving quickly heats potatoes while keeping them a healthy food. Clean the potato; do not use foil in a microwave. You may need to cut a large potato in half or smaller to speed the cooking process. If the potato is small, poke a few holes all over it with a fork to allow steam to escape. Place the potato or pieces in a microwave dish with a 1- or 2-inch bath of water. As the water heats, it seals in moisture and helps thoroughly cook the potato. Cook the potato in several 2- to 3-minute increments until soft to the touch. Picking healthy ways to prepare potatoes keeps your family happy and provides mealtime variety. Instead of salt, season whole or mashed potatoes with cracked pepper, cinnamon, cardamom or a touch of cayenne pepper. Add more flavor with freshly chopped chives or basil. 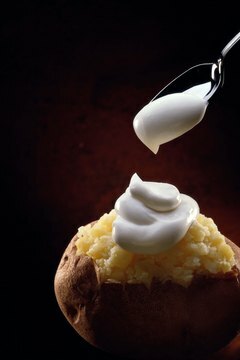 Instead of fatty butter or sour cream, top your baked potato with nonfat Greek yogurt, which also blends with mashed potatoes. 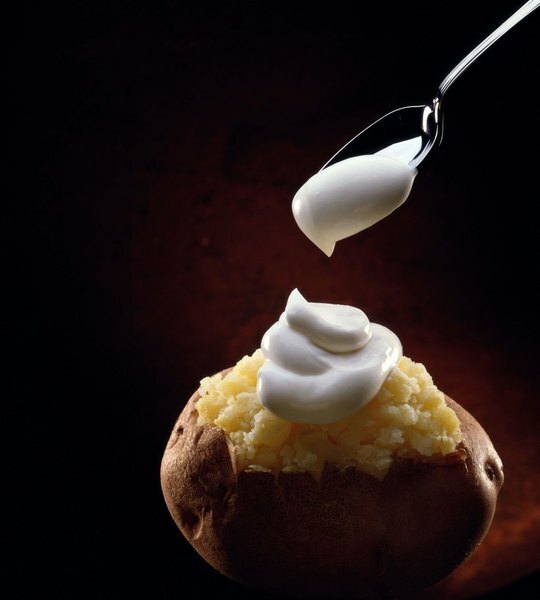 An ounce of nonfat plain Greek yogurt adds calcium and protein to your serving of potatoes for less than 20 calories.